Synopsis: A nine-year-old amateur inventor, Francophile, and pacifist searches New York City for the lock that matches a mysterious key left behind by his father, who died in the World Trade Center on September 11, 2001.
Review: The loss of a parent, at any age, is an indescribable feeling that is nearly impossible to put into words. Until you experience it there is no way to communicate what the world looks like after – it can never be the same and your job now is to find that “new normal” to get your through the days, weeks, months, years without your loved one. Losing a cherished parent as a developing child and the strange journey the child begins is just the jumping off point of this adaptation of Jonathan Safran Foer’s 2006 novel of the same name. Jumping back and forth in the span of a year, we follow Oskar Schell (Horn) as he navigates life without his trusted father (Hanks) who perished in the World Trade Center. It’s clear from the outset that Oskar has emotional challenges his parents and grandmother are accustomed to, support, and acknowledge. 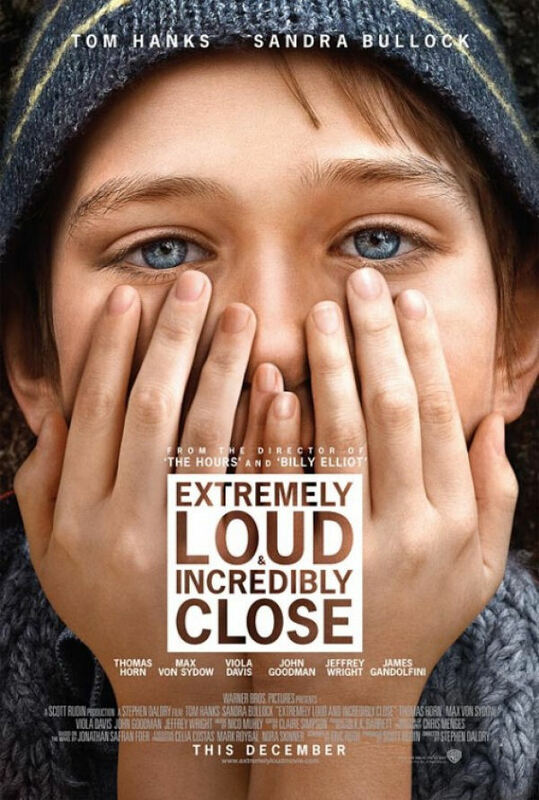 The film never says but it is s implied Oskar is slightly autistic or has a mild case of Asperger’s Syndrome which causes him to be introverted to most outside of his core family. Clearly brilliant with a wonderful imagination, Oskar is well-spoken and acutely aware of how others see him. His father champions his sense of adventure and the two are shown as best friends. Bullock is clearly the second favorite parent, making her parental role that much more difficult when mother and son find themselves needing to rely on the other. A year after the event, a random discovery propels Oskar on an adventure that will push him out of his comfort zone and re-introduce him to city that is still in mourning itself. While some directors may have felt the urge to make NYC itself another character, Daldry instead uses the city as a playground for his huge cast to operate off of. It’s a wise choice as the people Oskar meets nearly leap off the screen, making for an effective experience as an audience member. Horn is remarkable as young Oskar, a tough role for any actor worth his salt. There’s such a fine line in playing the inner workings of a child with emotions that are muted but come out loud and clear when challenged and Horn deftly conveys all of this with power and conviction. Watching the trailer I felt like his character would be grating and maudlin but it’s the exact opposite. He’s so much better than the preview showed him to be and he’s perfectly cast here. This is Horn’s first movie role…he was discovered after he won a hefty sum on Jeopardy! and I can’t imagine child actor in Hollywood now being better for this. Hanks and Bullock have smaller roles than the ads would have you believe…with Hanks’ contribution being a glorified cameo. His time onscreen is just right…enough to make you feel his presence when it is missed by characters onscreen. In Bullock’s first role since her Oscar-winning turn in The Blind Side, she plays it nice and reserved which only adds to the impact of her final scenes with Horn in the movie. Von Sydow is at a career best here as The Renter – a mysterious man living nearby with his own set of secrets and journey to go on. Early Oscar buzz for him is well justified playing a mute and never speaking a word the entire film. He conveys so much about what he’s feeling and processing through his eyes and body language that dialogue would be superfluous. Caldwell has a few good moments as Oskar’s grandmother as does John Goodman in a blink and you missed it role as a doorman. Singling out Davis and Jeffrey Wright for a moment I gotta say what these two do with their material is nothing short of amazing. It’s clear Davis is going to have a long and well-rewarded career. With limited screen time she hits the ground running and the way she enters the film may make you forget you haven’t met her previously…it’s a wonder. Wright’s impact touches down at another point in the film too good to reveal here. Including this, in the past 11 years Daldry has directed four films and been nominated for an Academy Award for all three previous efforts. There’s a reason for that. He has a eye for composition, an ear for dialogue, and an attention to what provokes a reaction in an audience. That’s not to say the movie is manipulative because it isn’t. Yes, there are moments where it gets awfully intense but they spring from real feelings and situations that we are reacting to. The film has gotten a mixed reception from certain critics and I’m struggling to see why. I think any movie that has to do with an aspect of 9/11 is scrutinized for sensitivity. I’ve read that Daldry worked carefully with survivors to ensure that he was telling the right story and their support for the film has been noted. This is not a movie about 9/11…please be clear. The events that leave Oskar without a dad could be replaced by any number of random acts of violence, disease, or despair… The movie is ultimately about healing and the setting adds to that impact – within a city that is mending itself, Oskar seeks answers that might just help to heal more than his broken heart. My my Mr. Joe, I had no idea! This is a great review. Why do you not own your domain name & use it, & why I have I not heard of this blog before now? You need to spread the word & toot your own horn more.